Recently I read an article about a somewhat curious approach to managing your email inbox dubbed Yesterbox (via SimplicityBliss). This idea sounded intriguing to me, so I thought I would give it a try. It quickly became apparent, however, that it would be difficult to emulate in Gmail (my email client of choice) as there is no convenient way to view yesterday’s emails without performing a custom advanced search each time you want to view your Yesterbox. The closest I managed to get was to perform an advanced search, filtering by “Date within 1 day of yesterday”. Unfortunately this resulted in emails from the day before and after yesterday being included in the search results. Not what I wanted. I then performed a cursory search on the internet to find a solution native to Gmail, but without luck. The first approach to fixing the problem that came to mind was writing a bookmarklet. So I did that. I like to call it Yesterboxmarklet, a bookmarklet that filters your email in Gmail so that you have a view of yesterday's emails only. Try clicking Yesterboxmarklet to test it out (you need to be logged in to Gmail for it to work). If you like the results and want to try out the Yesterbox approach for a while to see if it suits you, drag the bookmarklet link up to your browser’s bookmarks bar to save it permanently. Give it a click. If all goes well, voila! 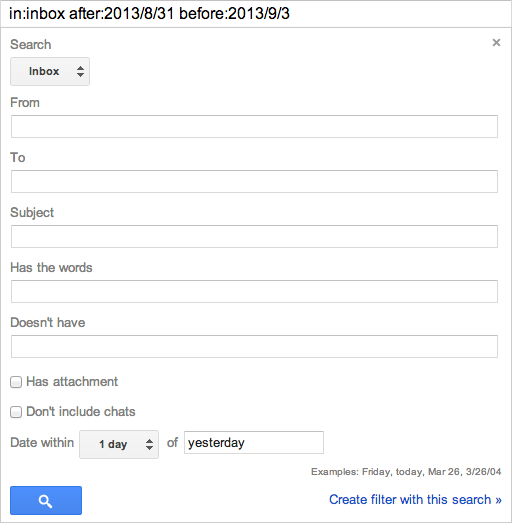 Yesterbox in Gmail! Disclaimer: I've only tested this on the latest versions of Chrome, Safari and Firefox on OS X. It's not perfect and has a few issues. For example, searches on the first day of the month work, but the "after" day in the date filter is 0, not 1. It also doesn't work on Chrome's new tab page, which is a result of security measures put in place by the Chrome team. Also, this bookmarklet went through many iterations and was more a pain to write than I thought. Currently it just opens a new window pointing to a page on this site that runs the below code. Any feedback on this approach or bug reports are most welcome. Recently, thanks to tmux, I have been enjoying the experience of having the majority of my development toolset consolidated within a single terminal window, which provides me with a common, distraction-free work environment. During Rails development I work almost exclusively within this workspace, but for some reason I have been reluctant to leave MacVim behind and transition fully to a text-only environment. I’m not sure of the cause of this reluctance as I don’t take advantage of any of the extra features provided by MacVim so I eventually took the plunge and started to use terminal vim. I’ve really enjoyed the experience so far, but today I believe I have found a tool that will make it difficult to go back. If you use vim and tmux then I would highly recommend installing vimux. It is a fantastic vim plugin that allows you to send commands from within vim to another tmux pane in the same window, creating it if it doesn’t exist. One use case of this is to execute the current spec file that you are working on in vim in a new tmux pane and then whilst it runs you are free to navigate the file within vim. That is just one example and if it is not a clear enough explanation of the potential of vimux may I suggest the readme which shows some great examples of how it can be used. However, I read the readme and wasn’t immediately convinced so do yourself a favour and just install it. Copy the keybindings into your .vimrc and just give it a try. It’s great! As there aren’t any details in this post about my actual terminal configuration and tools, feel free to get in touch if you would like to know more about my current setup. As the title states, this blog post has been a long time coming. Too long in fact. I’ve deliberated over using a blogging service (like Tumblr) or building something from scratch using Rails. Neither choice felt quite right. Hopefully I’ve struck a decent balance by settling with Jekyll. Jekyll is a ruby gem that allows you to write your blog posts in a markdown language of your choice (mine being John Gruber’s Markdown) and insert those posts into layouts. This seemed like a decent compromise. I get full control over the site (styling, hosting, content control, backup, etc) without having to implement something that has been done hundreds of times before to a much higher standard than I could probably achieve. I’m sure I will become dissatisfied with some aspect of this setup at some point in the future, but for now I’m happy. As a software developer I struggle immensely with prioritisation. Setting up this blog has been a perfect case in point. Sometimes I wonder if I hide my procrastinating ways under the guise of perfectionism.